What Is A Cockapoo ? What Do The Variations Look Like? Cockapoo Litter Registration Form must be completed and submitted when the litter is aged between one and seven weeks old. Once accepted the Breeder Member will receive a confirmation e-mail, a copy of which can be printed by the breeder and given as a reference to the owner of the puppy at eight weeks old. Attached to the confirmation e-mail will be a printable Lineage Papers Order Form which can be given in the puppy pack so owners can buy the papers at their own discretion. Cockapoo Litter ID Log Form must be completed by the Breeder Member. Full details for each puppy must be submitted. The information you supply will be used by The Cockapoo Club of GB for administrative purposes within the terms of the Data Protection Act 1998. We shall not supply it to third parties. PLEASE ENSURE THAT ONE PARENT MEETS THE MINIMUM HEALTH TEST REQUIREMENTS BEFORE SUBMITTING THIS FORM. Once your form is completed please press Submit button. Alternatively you can download a printable Cockapoo Litter Registration Form to submit details and payment by post. With the growing popularity and population of Cockapoos here in UK, sadly there are some circumstances where it is necessary to re-home a Cockapoo. 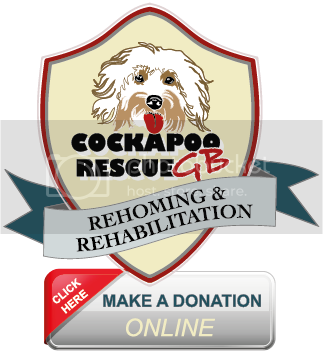 ​We offer a non-profit service and rely on good will donations to operate in the best interest of the Cockapoos in need. Click here to go to the rescue page for more information.